With our scientifically and technologically advanced global economy of seven billion people, why do 800 million people go hungry everyday? Why do offshore banks contain accounts for only 1 percent of the people who own 99 percent of the population? In “CAPITALlessISM,” the author Anthony Horvath, Ph.D., interestingly compares our economic system to a biological circulatory system. His premise is simple: Let nature be the prototype for economic engineering. “CAPITALlessISM” is a mindset of a macro-model for redesigning our inefficient national economy. It is a healthy, free enterprise based model that remedies a lack of capital. It has been practiced by banks using a fractional reserve banking; the process that entails a bank accepting deposits, making loans and holding reserves that are a fraction of its deposits. However, this model takes it one step further. The created mass of E-capital is shared with the government’s own PONC bank, a public-private banking partnership and is ultimately distributed to individuals and entrepreneurs. Although CAPITALlessISM may not be viewed as being politically correct, its controversial ideas attracts dissenters. The human factor and spiritual God element are fundamental. A pivotal feature is a decrease of inequalities among people and an emphasis on democracy, yet it is not about creating a welfare state nor Communism or Socialism. It is a scientifically designed virtual E-capital resource system. Its e-globalized operations are similar to the bank processes used 300 years ago. Transactions are based between needs and production without reliance on gold (uses kinetic capital like bitcoins). Horvath vehemently denies being a leftist or an economist. He admits that he did not invent the concepts. Instead, they are an amalgamation of many ideas expressed by Roosevelt, Pope Francis, Gandhi, Mandela and authors of “The Money Masters” which inspired him. Benefits of “CAPITALlessISM” includes the cancellation of most national debts and life sustaining types of personal debts (medical and educational costs). Options include repayment via the PONC bank or selling them off at fair market value. It would free many nations from high interest payments and austerity programs. Additionally, a network of national community based cooperative economic systems would be established to reconfigure groups of entrepreneurs according to size; thus creating a cooperative enterprise. PONC bank would manage the operations and entrepreneurs could finance their businesses with their micro-share of their portions (fractional reserve banking). Individual shares would be calculated based on productivity potential. No home equity needed. The graphic cover is eye catching and gives a glimpse to the cartoons and anatomical depictions used to capture Horvath’s complex ideas. The 680-page publication book is a combination of three books and offers a methodological approach to reading them. Book one contains an executive summary and overview. Book two discusses the legal grounds for reforms and secrets of free market forces. Book three covers the self sufficient national economy vs. interdependent globalized market economies. 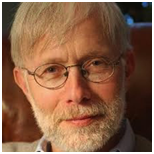 Dr. Anthony Horvath is a former professor at the University of Quebec. He was also a journalist and a consultant. Currently he is the founder of Horvath Research & Development. In 1957, the Hungarian-born immigrant arrived in Canada to escape Communism. As an innovative leader in information system design, he perceives the economy as a huge financial information system. I found this voluminous work absorbing and holding its posture throughout the explanations and illustrations, a task not easily achieved but done with skill. I would highly recommend “CAPITALlessISM” for anyone who wants to gain an in-depth understanding of his own personal financial standing as well seeking an insight into our nation’s economic engine. Horvath is the first to admit that his ideas are not completely original. He has been inspired by several sources including Franklin D. Roosevelt’s “Second Bill of Rights,” Thomas Edison’s speculations about a commodity-based currency, and even the human circulatory system. Yet his synthesis of these various models is unique. At its core is the concept of working to eliminate the selfishness and greed that pervades the world’s economies and instead striving toward ways to truly help meet the needs of all people and nations. For example, the International Monetary Fund could be transformed into the International “Mothering” Fund, an organization that would help nations in crisis like a mother nurtures a fetus. And once the nation is again self-sufficient, it won’t slide back into economic instability because it will also not be required to pay back the funds that had been used to rescue it. Horvath is passionate about his subject, and it shows in his writing. Like a good teacher, he uses a variety of methods such as cartoons, charts, equations, etc. to get his points across. Highly detailed yet very readable, his massive book offers much to think about. 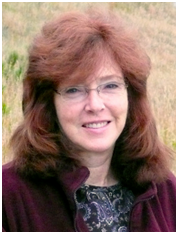 COMMENTS BY DR. ANTHONY HORVATH PUBLISHED BY DR. ELLEN BROWN ON HER WEB. Ellen Brown, world known author, attorney, speaker, activist has published ten of my comments referring to my book and She has expressed a very favorable opinion about my views on her web. thank God that several other authors think the same way!!!!!!! So how could we reverse the crisis? Interesting! That’s my vision as well. It’s also Scott Smith’s, the presidential candidate I just interviewed. See previous post. Thanks! dear Dan…. 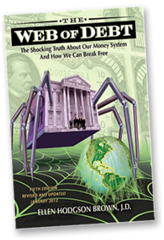 from Dr. Anthony Horvath, author of CAPITALlessISM….. http://capitallessism.com/ …..-1- the present private banking structure has to evolve into a Public-Private banking system… in harmony… -2- the present artificial capital creation process under private banks control, must become a public property licensed back to them. -3- the size of National debts must be reevaluated under certain new legalities. -4- Economy work with only with people in mind… the HUMAN FACTOR …. -5- Durable economic reforms may be achieved only peacefully with a certain elusive god-factor … without revolutions. Dr. Anthony …. why is it that the money supply has to be nationally created ? Why can’t the market participate in creating money supply that is of an asset origin and debt-free ? thank you for your very interesting question, …. national control over money supply creation should be a national process vs a privatized priviledge SOLELY UNDER the jurisdiction of private banks. -1- First, that governments, at least in principle, have an OVERALL assessment of the GLOBAL CAPITAL needs of the people, institutions and enterprises, while ”market interests” have only a FRACTIONAL view of these same needs. Consequently, governments must also have the corresponding OVERALL CAPITAL CREATION CAPACITY to sustain these needs in a nation. On the other hand, since ”market assessment of these same needs” are only a FRACTIONAL view of global human needs, (because they are biased by private interests from their own profitability perspective), they should also have at best, only a FRACTIONAL CAPITAL CREATION CAPACITY along with democratic governments. While profit perspectives are most important in a free enterprise society, they are nevertheless useless to determine the capital needs of non-profit oriented services. -2- The second reason is that asset-based credit creation process is too restricitive. It presupposes that marketable assets exist already on which to consent a credit i.e. for new-capital. So in the absence of sufficient assets, it becomes too restrictive to the full development potential of those projects that cannot show an asset to obtain capital. So, because sufficient e-capital cannot be created by the traditional asset based ”market-oriented” virtual capital creation process we need innovative E-CAPITAL CREATIONS DESCRIBED IN OUR BOOK: CAPITAL-less-ISM, a MACRO-MODEL for a NATIONAL E-CONOMY. this is why we suggest a NATIONAL FRACTIONAL RESERVE BANKING PROCESS, FRANCHISED TO PRIVATE BANKS BY GOVERNMENTS, under the jurisdiction of NATIONAL PUBLIC BANKS. Dr. Anthony …. Where did you ever get the idea that asset based currency is too restrictive ? How can that statement be justified ? Originally, currency creation processes were based on gold reserves. i.e. the amount of currency issued were limited (restricted) by gold assets. i.e. the paper currency was equivalent to the gold reserves. Since this proved insufficient to produce enough ‘’paper’’ capital to sustain the war efforts of opposing nations, the concept of fractional reserve banking was introduced by banks in order to issue much more paper/credit capital than covered by the gold reserves. (… presently over 100 new virtual artificial dollars are issued for each one in the reserve…). But, today this process is still insufficient to cover the hyper-exponentially growing development-capital needs of the exponentially growing world population. This is a MATHEMATICAL EVIDENCE … so emerging nations need new capital creation concepts, instead of begging foreign investors for no-existent capital. So, ‘’asset based currency creation’’ seems to be outdated. Consequently, we recommend in our book CAPITALlessISM ….that -1- the present private banking structure has to evolve into a Public-Private banking system… in harmony(not nationalized as leftists advocate) -2- the present artificial capital creation process under private banks’ control, must become a public property licensed back to them. So the new virtual-capital created should be a commodity based and a production potential based (not gold-reserve based) NATIONAL property -3- the size of National debts must be re-evaluated under certain new legalities. -4- Economy can work only with people and family needs in mind… the HUMAN FACTOR …. -5- DURABLE economic reforms can be achieved only PEACEFULLY with a certain elusive god-factor … without revolutions and the present RADICALIZATION TENDENCY. thank you Lise, for your very interesting question, …. national control over money supply creation should be a national process vs a privatized priviledge SOLELY UNDER the jurisdiction of private banks. -2- The second reason is that asset-based credit creation process is too restricitive. It presupposes that marketable assets exist already on which to consent a credit i.e. for new-capital. So in the absence of sufficient assets, it becomes too restrictive to the full development potential of those projects that cannot show an asset to obtain capital. So, because sufficient e-capital cannot be created by the traditional asset based ”market-oriented” virtual capital creation process we need innovative E-CAPITAL CREATIONS DESCRIBED IN OUR BOOK: CAPITAL-less-ISM, a MACRO-MODEL for a NATIONAL E-CONOMY.this is why we suggest a NATIONAL FRACTIONAL RESERVE BANKING PROCESS, FRANCHISED TO PRIVATE BANKS BY GOVERNMENTS, under the jurisdiction of NATIONAL PUBLIC BANKS. …. items of interest on “It’s Our Money” this week, Ellen Brown interviewed Independent presidential candidate Scott Smith, who has a clever plan for eliminating austerity, income taxes and the federal debt without creating inflation. At the end of November, an Italian pensioner hanged himself after his entire €100,000 savings were confiscated in a bank “rescue” scheme. He left a suicide note blaming the bank, where he had been a customer for 50 years and had invested in bank-issued bonds. …..
Dear Ellen Brown…!!! 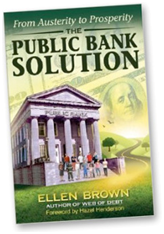 public banking is the answer as you advocate it. HOW TO PREVENT BAIL-INS, or BANKS TAKING OUR SAVINGS? By reinventing the entire banking industry and by reinventing a new type of national currency (for circulation to link population needs to production capabilities in the nation) …. This can be done with a new public-private-cooperative banking structured network .. and by reinventing Edison’s commodity based currency … based not gold reserves but on commodities and production potential,( instead of the bank owned dollar). This new virtual currency system is similar to a national E-voucher system (activated through a wireless cell-system), outside of the present legal jurisdiction of private banks. This new E-cash currency system could be developed similar to a gigantic virtual barter system. So instead of private banks, we will have APPLE-BANK or GOOGLE BANK administering it under government supervision, Your personal production potential, could be linked up to an employment potential, linked up to a e-cash issued to you to sustain your survival consumer needs. Thank you for your comments back. Founder of the Labor Institute, Les Leopold, about how the market mechanics of inequality have succeeded over the past 40 years and what we can do collectively to bring about real change. She also discusses her latest article about the looming crisis that could be triggered by the new practice of bailing-in depositor money to save failing banks. And Matt Stannard delivers some words about money from the mouths of historical figures. Listen to the archive here. from Dr. Anthony Horvath, author of CAPITALlessISM…..
the ANTI-BANKS …. A PREVENTIVE ANTIDOTE TO THE DANGERS OF BAIL-INS : a mas effort to establish jointly a PUBLIC COMMUNITY BANKING network with many COOPERATIVE CREDIT UNIONS also with the ENCOURAGEMENT OF CHURCHES COMMUNITIES. we discuss these issues in my book. WHY…? THE AMERICAN DREAM IS DEAD! THE MIDDLE CLASS HAS TOTALLY ERODED TO BECOME THE NEW SLAVE CLASS. Since the Communist economic vision has collapsed, the ultra-capitalist-corporatism forces dominate the economy and the middle class collapsed. Economy has become too complicated for most of us to understand. The FREE and FAIR, DEMOCRATIC CAPITALISM that has developed America has been kidnapped by CORPORATISM. What is it? It is a radical fundamentalist form of ultra-capitalism. CORPORATISM is the privatization of a Communist-state-styled economic dictatorship by corporations. A LIVE EXAMPLE : In Quebec, as an antidote to the dominance of banks during the depression years of the 1930-s contributed to the economic awareness of the population to seek alternative solutions. PUBLIC COOPERATIVE COMMUNITY BANKS… called CAISSE POPULAIRES. Under the Church’ spiritual authority seventy-five years ago in church basements people started the movement Desjardins, a cooperative community banking system. People gathered to discuss economic issues, such as financing enterprises, home financing, put their meager savings together etc. The result was the astonishing new concept of forming community cooperative credit unions. With the church’s encouragement, in a short seventy-six years, Quebec has built up several economic giants: Quebec’s Caisse Populaire Desjardins, a financial cooperative movement, valued at over $220 billion (among the world largest banking institutions) and the Caisse de Depot et Placement, valued at over $150 billion. Add also, the Bank National and the Laurentian Bank, as well as the investment capital Fond de Solidarité. Add over all these, a cooperative concept for a vast network of small and medium size enterprises, with its ramifications in many sectors of the economy. Quebec has the most elaborate cooperative system in the world. So yes, people can do fantastic achievements collectively when they become aware of a commune danger. If I add the huge technical potential of the social networks …. we might have new financial institutions in short months like UBER-BANKS to counter traditional banks or like like APPLE-BANKS …. GOOGLE-BANKS …. a determined community may very well prevent bail-ins…. dear R A FEIBEL and Johnraymondnolan, … yes, THERE IS HOPE!!! your descriptions of apocalyptic views of the economy are very real indeed and it is a wake-up call to all of us. We have all become too comfortable with the idea that from cradle-to-grave a good uncle Sam’s ”American way” will automatically take care of us and flourish our culture. Well. we cannot take it for granted !!!. …but only, a COLLECTIVE COMMUNITY TYPE AWARENESS is the beginning to react to these dangers.. It is the key. Thank God, for social media… our education level, instant information availability and human ingenuity… and an elusive ”GOD-FACTOR”. THE REST will come slowly by itself: PUBLIC-BANKING, COOPERATIVE ENTREPRENEURSHIP, COMMUNITY-SPIRIT OF MUTUAL NEIGHBORING HELP .under the guidance of our two thousand year old Judaeo-Christian Heritage. In ”CAPITALlessISM…..” we discuss the deep long-term effect of a CERTAIN ”GOD-FACTOR” ON THE ECONOMY. Every economic-military dictatorship in history have collapsed under this mysterious ”God-factor” and under the ingenious human resistance awareness reactions :… the Roman-Empire, the Ottoman Empire, the British colonialism in India (with Gandhi), in Africa (with Nelson Mandela), Communism ….. But what took centuries because of the poor communication technologies and illiterate masses of people at the time might take only only a very short generation to react to these new forms of economic dictatorship.